The beautiful surrounding of the Dumfries House Estate are a great location to hold your wedding. Inside the House, the elegant Tapestry Room provides a regal setting to host your wedding ceremony, while the Dumfries House Pavilion is the ideal space to enjoy your wedding breakfast before an evening of music and dance. Over the course of 2019, we will be speaking to local business owners about how to plan the perfect wedding, from choosing seasonal flowers, through to wedding cake trends and sourcing a quality food caterer. 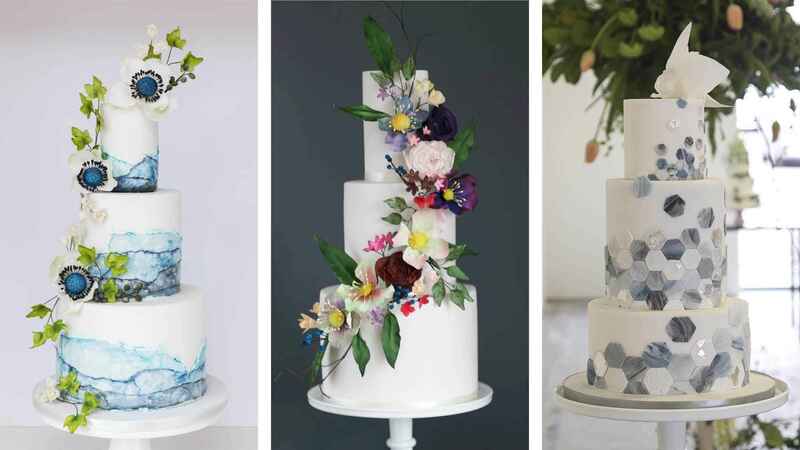 For our first article in our wedding planning series, we speak to Happyhill Cakes’ founder Emily McGregor about the wedding cake trends to look out for in 2019. How would you describe a traditional wedding cake? I think a traditional wedding cake would have been a white or ivory cake, all or mainly made of fruit cake, with 3 or 4 quite shallow tiers and plenty of piping and sugar flower decoration. The modern wedding cake is quite different in that the tiers tend to be different types of sponge or mud cakes, deeper in height with more layers of cake per tier, and with more colour throughout the decoration. It’s quite rare to be asked for a fruit cake these days, although sometimes the smallest tier could be kept for an anniversary or christening. I think the different flavours of each cake are seen more as part of the food to be served up and eaten on the day, rather than being kept for guests at a later date. What sort of wedding cake trends are you seeing at the moment? What requests are you getting that are different from traditional cakes? I love making natural looking sugar flowers and find that many couples look for a less formal, tumbling style to the flowers, with colours and often foliage too. Edible lace, pearls, sugar ruffles and metallics are also popular. I also like hand-painting, modern geometric shapes and prints, and have enjoyed experimenting with different textures and effects to give couples options to make their cake really individual. How do people go about choosing a wedding cake? Do you normally offer suggestions or do people usually come with an idea in mind? Sometimes couples come to me with an idea in mind, more often than not there would be just a general colour scheme and inspirations, even just a certain type of feel. Usually, couples come to me for a consultation to try some cake samples (very important!) and talk about the design before I sketch it up. It also works if couples can’t come for a consultation by posting samples and chatting via email. And when a couple live overseas they might just decide on flavours they like the sound of, or I can post samples to a trusted friend to help them choose! What's your most popular style of wedding cake you offer? A soft buttercream finish with natural looking sugar flowers is quite a classic cake that suits most weddings, and sugar foliage can look really great in a ‘growing’ style up the cake – cakes like these can look modern but understated. I really like it when a couple really wants to have a cake that isn’t like any other one they have seen before – it’s an opportunity to make an individual statement. What's your favourite part of making or decorating a cake? Any special techniques or tips? Tips would be that generally speaking less is more and try not to have too much of a specific idea in your head as it’s quite nice to talk it through and find some tweaks that can make it your own. I spent quite a few years running a farmers market stall to learn about baking, but now that I make mainly wedding cakes I enjoy the decorating part the most! Plus I get to meet lots of fab couples, and I love hearing about their day after the event! See more of Emily’s creations of the Happyhill Cakes’ website here.